After years of chatter and construction, the W Hotel group has finally opened the doors of its long anticipated outpost in Amsterdam. Taking over two monumental commercial buildings located opposite each other in the heart of the city, the conversion, by Amsterdam practice Office Winhov, maintains original façades and structural features, while interiors by Tel Aviv-based BK Architects incorporates custom fittings by local producers and takes inspiration from the building’s former life as a telephone exchange, bringing a touch of the city to each of the 217 rooms and 21 suites. 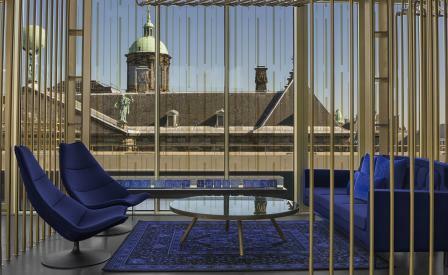 Flipping check in on its head, the top floor lobby in the Telephone Exchange commands 360 degree views over next door neighbours Dam Square, the Royal Palace and the serene townhouses of the Singel canal. While across the road, in the impressive main hall of the Bank building, flagship restaurant, The Duchess dishes up a dose of contemporary grandeur for champagne fuelled high teas, cocktails and dining. Here, the eatery will soon be joined by 66 of the guest rooms, the hotel’s spa and gym facilities and a creative incubator space that will champion local design, fashion and music, further injecting life into the city’s liveliest locale.